On April 23 from midnorthern latitudes, start looking for Mercury half an hour after sunset. The planet Mercury is often cited as the most difficult of the five brightest naked-eye planets to see. Because it's the planet closest to the Sun, it never strays too far from the Sun's vicinity in our sky. It is often referred to as "the elusive planet." And there's even a rumor that Copernicus, never saw it, yet it's not really hard to see. You simply must know when and where to look, and find a clear horizon. And for those living in the Northern Hemisphere, a great "window of opportunity" for viewing Mercury in the evening sky is about to open up. Mercury is called an "inferior planet" because its orbit is nearer to the Sun than the Earth's. Therefore, it always appears from our vantage point to be in the same general direction as the Sun. In the pre-Christian era, this planet actually had two names, as it was not realized it could alternately appear on one side of the Sun and then the other. Mercury was called Mercury when in the evening sky, but was known as Apollo when it appeared in the morning. It is said that Pythagoras, about the fifth century B.C., pointed out that they were one and the same. Mercury just passed superior conjunction on April 16, but in the days to come it will bolt out to become easily visible low in the west-northwest at dusk. On Wednesday evening, April 23, Mercury should be visible within about 30 minutes after sunset if your sky is quite clear. Mercury will be shining at magnitude ?1.6, slightly brighter than Sirius (the brightest of all stars). In fact, at that particular hour of the day, Mercury will be the brightest object in the sky! In the evenings that follow, Mercury will slowly diminish in brightness, but it will also slowly gain altitude as it gradually moves away from the vicinity of the Sun. This is just the start of Mercury's best apparition of the year for mid-northern viewers. On the evening of May 6, be sure to look for a delicately thin sliver of a 1.5-day old crescent Moon sitting just a couple of degrees above and slightly to Mercury's right. Mercury, like Venus, appears to go through phases like the Moon. Right now, Mercury is a nearly full disk, which is why it starts off appearing so bright. 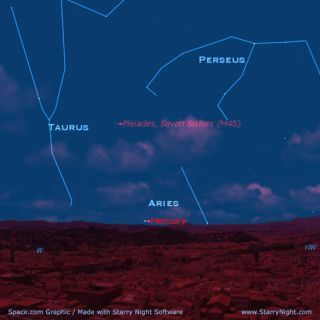 Mercury reaches its greatest elongation, 22 degrees to the east of the Sun, on May 14. Shining at magnitude +0.4 (as bright as the star Procyon in Canis Minor), it will set nearly two hours after the Sun. By the time it arrives at its greatest elongation, it will appear roughly half-illuminated and the amount of its surface illuminated by the Sun will continue to decrease in the days to come. So when it begins to turn back toward the Sun's vicinity after May 14, it will fade at a rather rapid pace. In fact, on the evening of May 22, Mercury's brightness will have dropped to magnitude +1.7; only 1/20 as bright as it was on April 23. In telescopes it will appear as a narrowing crescent phase. This, in all likelihood will be your last view of it, for the combination of its lowering altitude, plus its descent into the brighter sunset glow will finally render Mercury invisible by the final week of May. In old Roman legends, Mercury was the swift-footed messenger of the gods. The planet is well named for it is the closest planet to the Sun (at an average distance of 36 million miles) and the swiftest of the Sun's family, averaging about 30 miles per second; making its yearly journey in only 88 Earth days. Interestingly, the time it takes Mercury to rotate once on its axis is 59 days, so that all parts of its surface experiences periods of intense heat and extreme cold. But we cannot say that a solar day on Mercury lasts 59 days because its highly eccentric orbit causes an effect known as a 3:2 spin?orbit resonance. As a consequence, because Mercury rotates three times for every two times it revolves around the Sun, the time it takes from one sunrise to the next is equal to about 176 days. So for 88 days, the Sun is constantly above the horizon and surface temperatures soar to nearly 900 degrees F (482-degrees C). Daytime temperatures are high enough to melt zinc and tin. Then comes 88 days of darkness, with surface temperatures plummeting to -300 degrees F (-184 degrees C) — the greatest range of temperatures of any planet. In fact, on some parts of Mercury's surface, it is even possible to see the Sun briefly reverse its course in the sky. This happens around the time that Mercury arrives at that part of its orbit which places it closest to the Sun (called perihelion), where it's orbital speed can briefly exceed its rotational speed. At sunrise, this strange effect would cause the Sun to appear to rise above the horizon ... then slow to a halt ... then reverse direction and drop back below the horizon. At sunset, the Sun would drop below the horizon, then pop back up into view before resuming its normal course, ultimately setting again for a second time within a week.